Expect the unexpected and good things will happen. 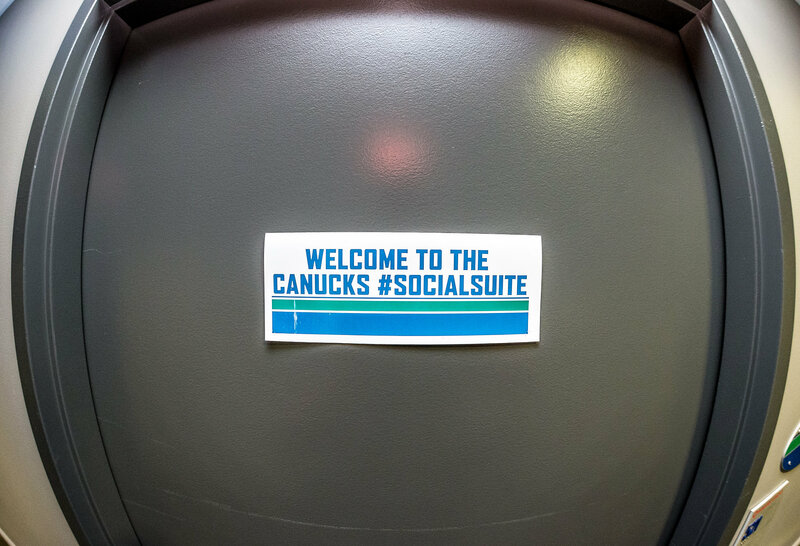 This past Christmas I was presented with an incredible surprise: an invitation to participate in the Vancouver Canucks #SocialSuite night on January 8th. 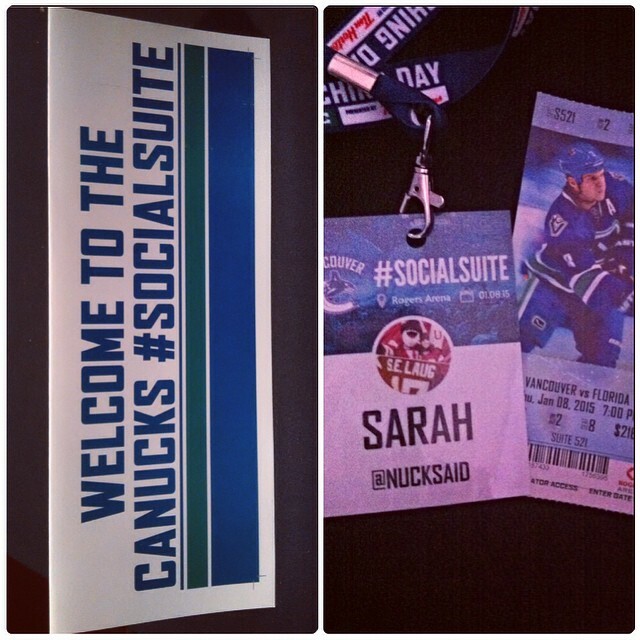 What is the Vancouver Canucks #SocialSuite night, you ask? I will tell you. 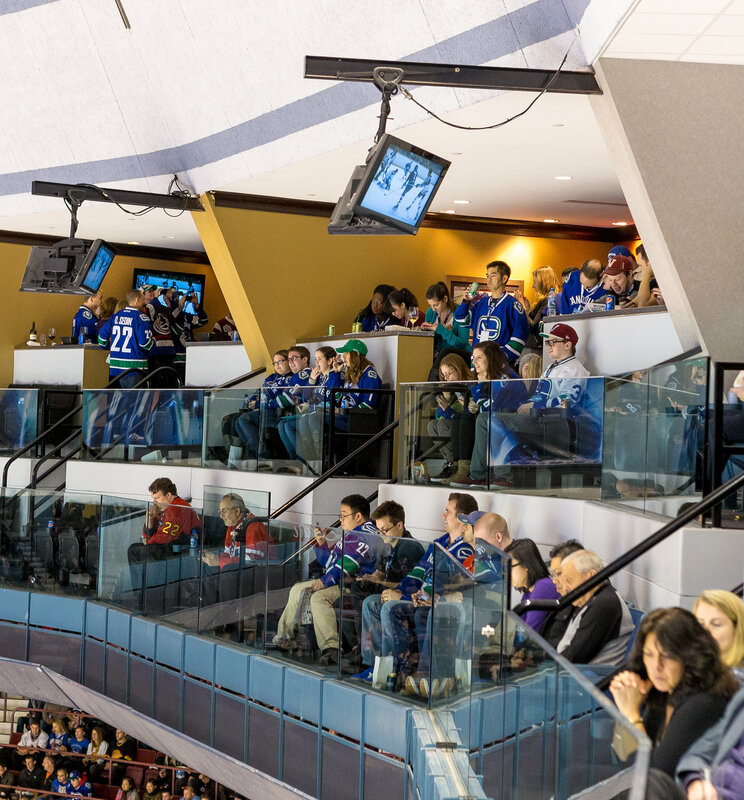 It was a night in which a variety of Canucks fans and bloggers were invited to view the game together in a SUITE. A view like no other, great food, impeccable company, an opportunity to see Roberto Luongo play one more time and perhaps just perhaps there would be a special guest or two. 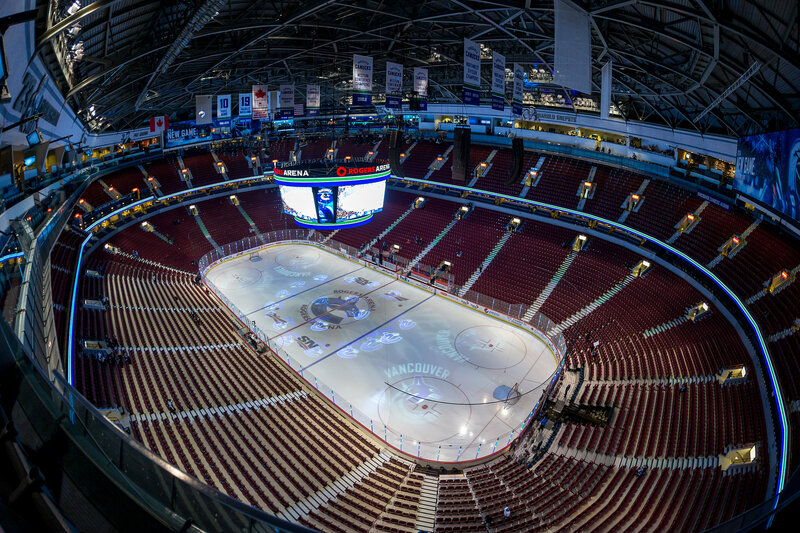 I am beyond grateful that I was asked to be a part of this Canucks fan experience. I did not know what to expect as I had never been to an event like this before. Sure, I had crossed paths with a few of the fellow attendees on social media prior to the game but never in person. Rest assured once there, everyone was so kind and inviting that there was no place for the nerves. Watching the Canucks game with fellow dedicated fans in person was absolute perfection and yes felt very familiar to when we usually “Live Tweet” the games together. It was nice to finally put names to faces while sharing the unforgettable experience together in person. This night was not just the Canucks Social Media Suite night, but also marked the return of Luongo for the first time since he was traded in March 2014. For the Luongo fan in me, I was beyond ecstatic to get to see him play one more time in the arena he once called home; even if it was odd seeing him play on the wrong side of the rink and wearing the wrong jersey. This night, this game was all about Luongo and the fans giving him the respect that he has ALWAYS deserved. The building was electric when their former number one stepped onto the ice treating him to a round of “LUUUUU” cheers every time he touched the puck. The standing ovation that followed the tribute video(linked below), gave me chills seeing the entire arena stand in unison for the man that gave his everything to THIS team for eight years. Perhaps from the outside looking in, it seemed odd or even inappropriate to hear the home crowd cheering for the opposing goal-tender, but that is not what it was. This night was for the fans to have closure in a way that they were not given last season and to acknowledge Luongo for everything he did for this team. It may have seemed odd from the outside looking in, but from the inside it felt exactly right. Did I want the Canucks to win THIS game? Yes, of course I did but this night was Roberto Luongo’s night to shine and shine he did while stealing two points in his former home arena. Yes, a win for the home team would have made the #SocialSuite night even more epic than it already was, BUT seeing Luongo play at his best once more was also something I will never forget. 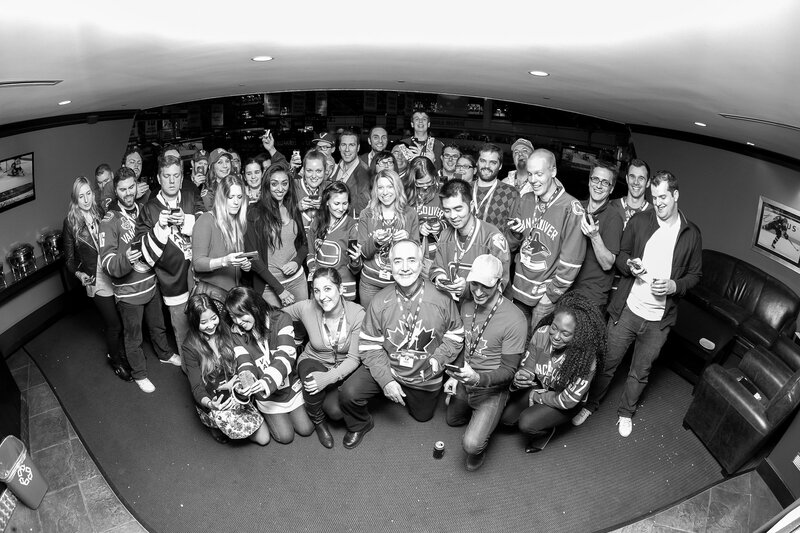 Without any further ado, I invite you along for the ride that was an epic night spent with some of the best Canucks fans and a few incredible guests! Everyone had a personalized name tag waiting for them…never have I ever felt so official at a game! Thank-you, Canucks! The calm before the storm, and the epic view from above. (You could say we had amazing seats). It was social media affair as evidenced by my tweeting in the above photo, but having my sister Jessica as my guest also made it a family affair. Quite an adventure, we did have! Group photo time! 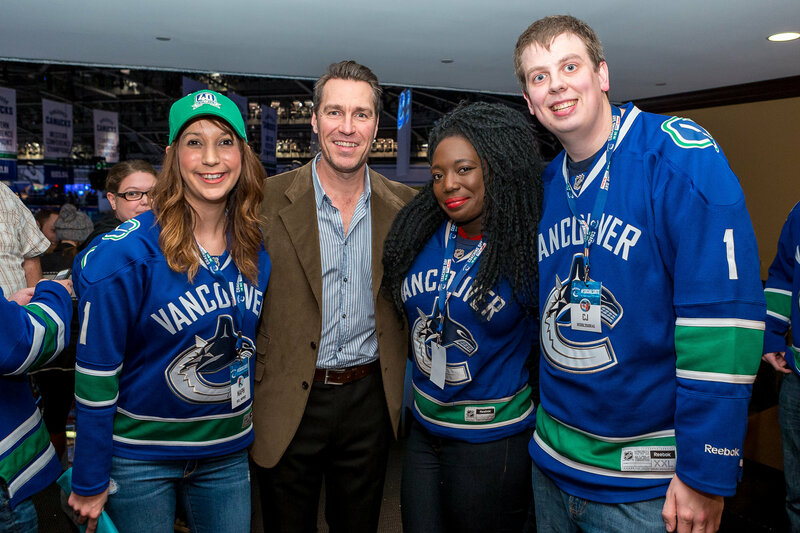 And YES, THAT is in fact Kirk McLean who snuck into our suite just as we were lining up for this photo. Cue the “Captain Kirk” selfies and group shots! Everyone wanted a picture with McLean and he was the epitome of patience letting everyone have their chance to get the perfect shot! (Yep..whispers of “THE SAVE” and “LEGENDARY” echoed across the room as everyone stood in awe). 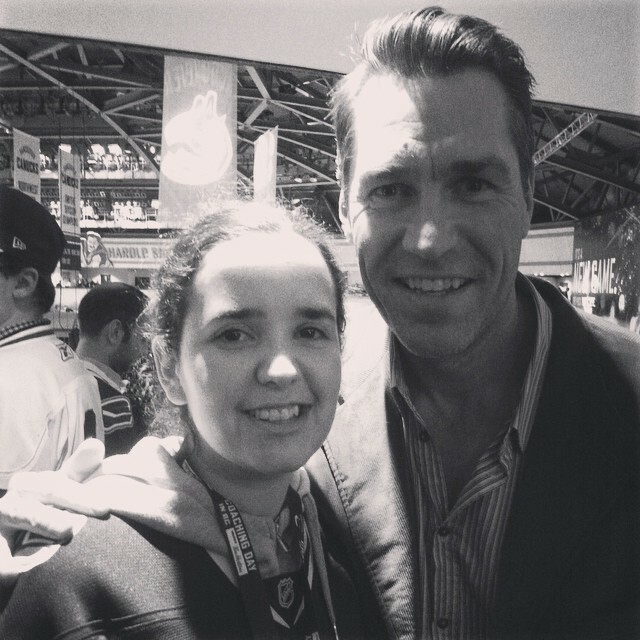 My sister finally got her picture with McLean! 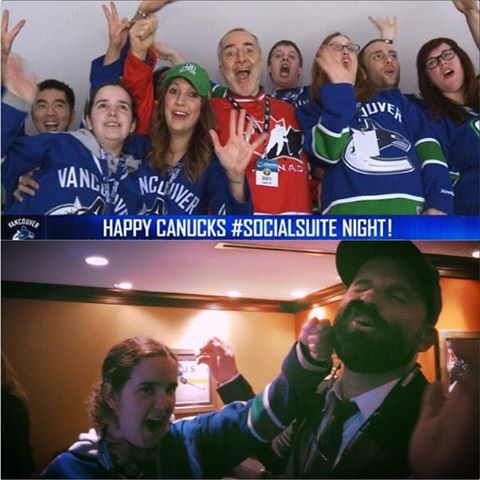 We made it on the Jumbotron, not once BUT twice in the #SocialSuite to say hello to the entirety of Rogers Arena! Oh and yes I may or may not have punched Johnny Canuck in the face who also stopped by for a visit with everyone…it was EPIC. and Fin sure did give our suite a thrill and helped to make the evening absolutely FIN-tastic! 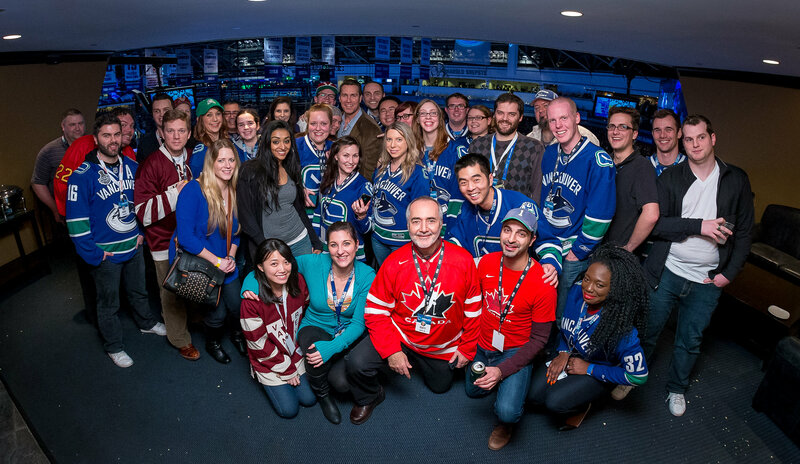 On behalf of myself and everyone who was lucky enough to particpate in the Canucks Social Media Suite Night, I cannot say thank-you enough. Thank-you to the Vancouver Canucks and Laura Wong for the incredible invitation and making this fan feel like part of something amazing. Thank-you to all the other participants who attended the event, it was amazing to meet you all, here’s to staying in touch and crossing paths again some game night! 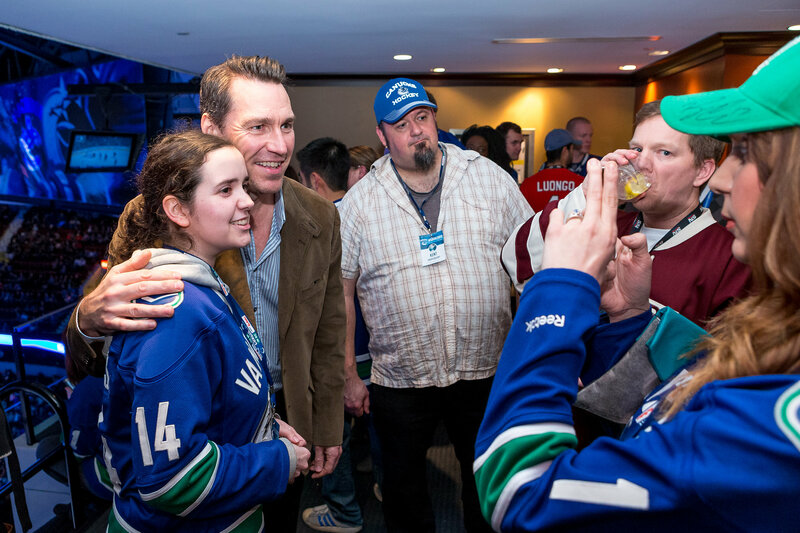 Thank-you to Fin, Johnny Canuck and Kirk McLean for helping make this one absolutely unforgettable night that this fan will never forget. Thank-you to photographer Devin Manky for capturing the best moments of this evening and sharing the pictures with all of us! 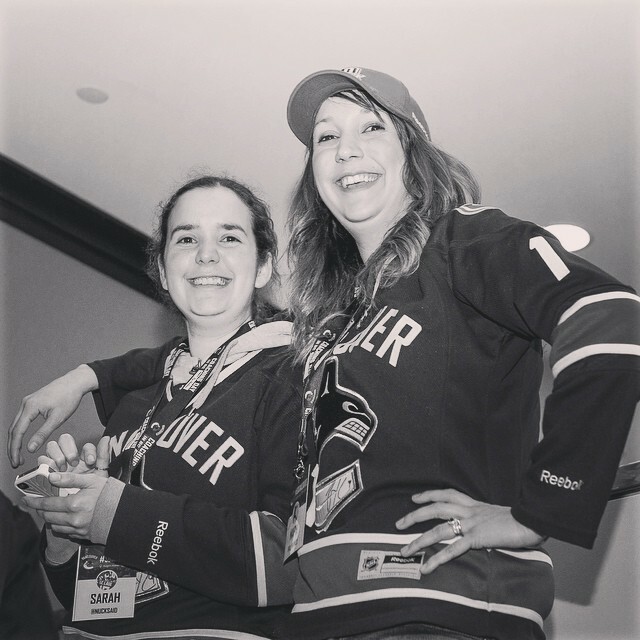 Thank-you also to special sponsor Save-On-Foods and their Canucks FAN ZONE program that were in part responsible for making this night happen and a massive success! Sincerely, THAT was one of THE best fan experiences I have ever had while watching a game at the arena. Can we do THAT again next game? 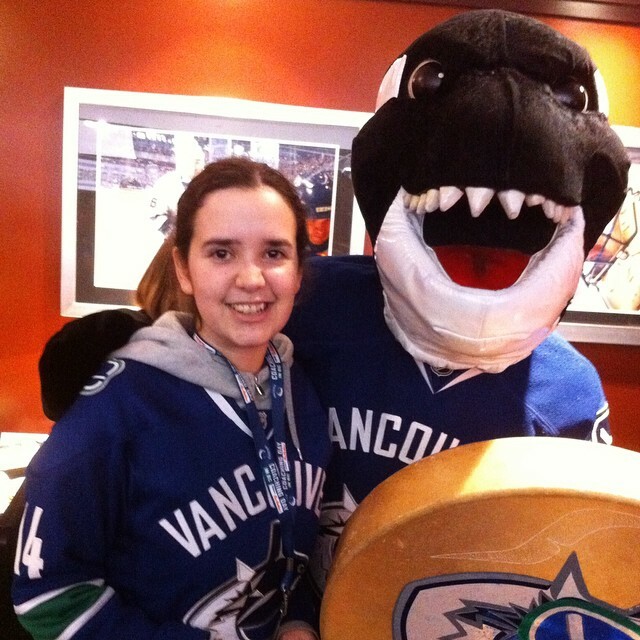 This entry was posted in Hockey, NHL, Vancouver Canucks and tagged #SocialSuite, Canucks fans, Canucks Suite, Fans night out, hockey, hockey bloggers, NHL, SaveOn Fan Zone, Vancouver Canucks by sarahlaug. Bookmark the permalink.